Jobbio is an inbound recruiting and hiring platform designed to connect companies with talent through personalized profiles, job boards, and unlimited job postings. The cloud-based platform also functions as an applicant tracking system to manage the candidate workflow from initial application to hiring. Users can showcase their brand by creating a fully customized careers page and posting jobs directly to the in-built Jobbio jobs board. Employers can use Jobbio to enhance their company branding and attract top talent with tools for creating a customized company channel within the platform, as well as unlimited custom job postings. Content such as videos, articles, and more can be published within the employer channel in order to attract candidates, and job postings can be published to the in-built Jobbio jobs board at any time as positions become available. Job advertisements can be customized with stackable panels and custom branding and content in order to attract the right candidates. Job listings are automatically published to the Jobbio marketplace and matched to over 50 external jobs boards including GlassDoor, LinkedIn, and Indeed. When businesses post job openings on Jobbio they are automatically matched to the most relevant candidates and delivered to their personalized job feed, and talent is directly connected to hiring teams so that there’s no need for third party interference. Applicants can be managed within Jobbio through the in-built talent management system. The dashboard provides businesses with an overview of the number of new applications, new messages, live jobs, total talent pool, and more, as well as an activity feed to track actions relating to active job postings. Applicants can be managed with auto-replies, tagging, filters, a searchable database, resume storage, candidate workflows, feedback management, and a talent pool to store unsuccessful or unsuitable candidates for future roles. Perfectly integrated with our website! Jobbio is our primary source of candidates! We don't have a career page so with Jobbio we have created our company page on their platform where we can add jobs and any information about our company! It perfectly integrates with our website and is super flexible! We can edit our page in real time just like it is on our website! The only difference with a normal career page is that our profile on Jobbio can be found by candidates and works as a job boards (2 for 1)! This is perfect to showcase our brand. They have recently fully renewed their product and for few days the integration wasn't working, but now everything is back in place with a greater user experience! This is the only software to find quality applicants that works! I think it is because of the company career page we have built (super easy to set up!) that allow us to showcase our brand to many professionals. Thanks to their job distribution methods we always get a lot of applications! It is perfect if you want to get quality and quantity at the same time as they help you with employer branding and job distribution! They just went through a full software redesign so it took us a bit to learn about the new features. Overall it looks better than the previous version. Best solution to build a talent pool! My favourite of Jobbio's ATS is the talent pool. It is possible to create a list of talent that you want to stay in touch with, and maybe contact again in the future! This saves us much time as we don't have to go through the recruitment process again and again! We also love the option to shortlist candidates so that you can save only the most qualified candidates for the position. I've never had a negative experience while looking to hire someone with Jobbio since I use this software. Best software to hire talent! - Integrated with our website, it is user friendly and easy to use - Superior job distribution strategy: candidates can easily apply through the job board or find the job on many aggregators - Their applicant tracking system is intuitive, easy to use and really helps you manage the relationship with the candidates thanks to the chat option. I can't really say anything negative thing about it. We have been using it for almost 2 years and we have never had a problem. Make job posting simple and get job applicants! Jobbio helps you with both getting your jobs out there and employer branding which could be a great fit for a smaller company who may not have the resources for this.We tried Jobbio for a client and I have to say we did receive a good amount of resumes through it. Mainly, we were interested in the 50+ job boards that Jobbio posted to. It also has a built in applicant tracking system to manage candidates as well. We tried Jobbio for a client and I have to say we did receive a good amount of resumes through it. Mainly, we were interested in the 50+ job boards that Jobbio posted to. It also has a built in applicant tracking system to manage candidates as well. We don't really have a use for the applicant tracking system, as we subscribe to our own. The aggregators Jobbio posts to are similar to what our ATS already does for us, so the value added may not be as strong for us. Once off payment for 30 days, or an annual plan, paid monthly. Hiring plans from €199 - paid monthly. Contact Jobbio for more pricing information. Build and fully customize a career page on Jobbio and post jobs directly to the in-built job board. Create an interactive company profile and give candidates all the information they need to land their dream job. Access over 100 million passive and active professional candidates. Jobbio posts jobs on to over 50 external job boards including LinkedIn, GlassDoor, and Indeed and partners with some of the biggest news and media agencies worldwide. Manage applications with ease using the live applicant tracking system. Search, track, filter, message and review talent in one place and build a live talent pool of resumes for future job openings. Make data driven hiring decisions and keep track of all candidates and activity on the personal Jobbio dashboard. Track the number of new applicants, open positions, new messages, and more from the dashboard. Control the application process with the ability to hire as a team, assess and review applications with multiple team members, provide feedback, give talent recommendations to other departments, and more. Below are some frequently asked questions for Jobbio. Q. What type of pricing plans does Jobbio offer? Q. Who are the typical users of Jobbio? Q. What languages does Jobbio support? Q. Does Jobbio support mobile devices? Q. Does Jobbio offer an API? No, Jobbio does not have an API available. Q. 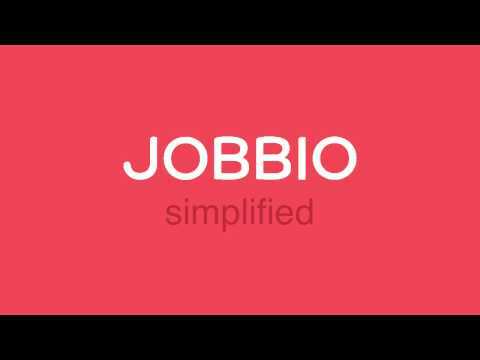 What other apps does Jobbio integrate with? Q. What level of support does Jobbio offer?